A sculpture of the Duke of Wellington's favourite horse has been unveiled at a Berkshire independent school. The 14ft (4.2m) head of Copenhagen, ridden by the Iron Duke at the Battle of Waterloo, has been cast in bronze by sculptor Nic Fiddian-Green. 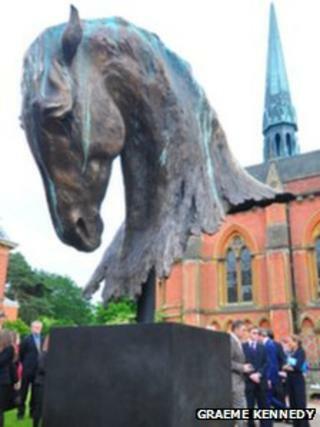 It was unveiled in the quad at Wellington College, Crowthorne to mark the school's 150th anniversary. Copenhagen was ridden back to England by the duke after victory over the French at Waterloo in 1815. The school was originally set up as a charitable educational institution in the duke's memory. Mr Fiddian-Green studied portraits of Copenhagen at the duke's home of Stratfield Saye in Hampshire, as well as a death mask of the horse kept in the basement of the Royal Academy.